We build dashboard solutions that impact education systems. Our in-depth understanding of K12 data sources and experience working with the education community (teachers, principals, district leaders, superintendents) enable us to build highly effective visualizations custom to each school system. We work with large, mid-sized, and small school districts around the country. We perform the backend data work required to make data dashboards update automatically. Our development cycle is fast and our platform is the best in the business (Tableau). We create professional development programs that produce skilled data consumers. Unlock the full potential of your SIS by connecting it to a dashboard system for attendance analysis. Districts large and small benefit from attendance analysis in a dashboard system. Monitor all of the student attendance by district, region, school, grade level, or any demographic variable available. There are no known technical limitations between our dashboard system and a SIS. Some of our most useful dashboards developed for school districts are based on historical data. Every SIS has historical data archived in its repository. We perform one time pulls for archived data in your system. The historical data is made available in a variety of ways for each end user of our dashboard system. We integrate historical and current data to provide deep analysis without interrupting the analysis flow of an end user. For example, if you are reviewing the attendance of a student for the current year based on a trend you discover, you can easily access the historical attendance by hovering over the student name and clicking a link in one step. The feedback we have received from clients regarding historical attendance has been very encouraging. Schools can provide better supports for students when they know the whole story (not just one year of data). We identify the granular attendance data in your SIS and automate the export of data to our dashboard system each night. Using daily attendance data allows us to aggregate the attendance data by any variable possible (district, school, grade level, gender, ethnicity, race, economic status, SPED status, ELL status, etc. ) and dis-aggregate the data down to a specific point in time for any student. We develop logic that changes the color of any data point based on district thresholds (i.e. a bar representing a grade level turns blue if attendance if over 95%). We have clients that require processing for tens of thousands of attendance records nightly and some with over 20 million rows of attendance data each night. All processes are automated and the data is updated in the dashboard system each day. The example shows the month of Feb selected. 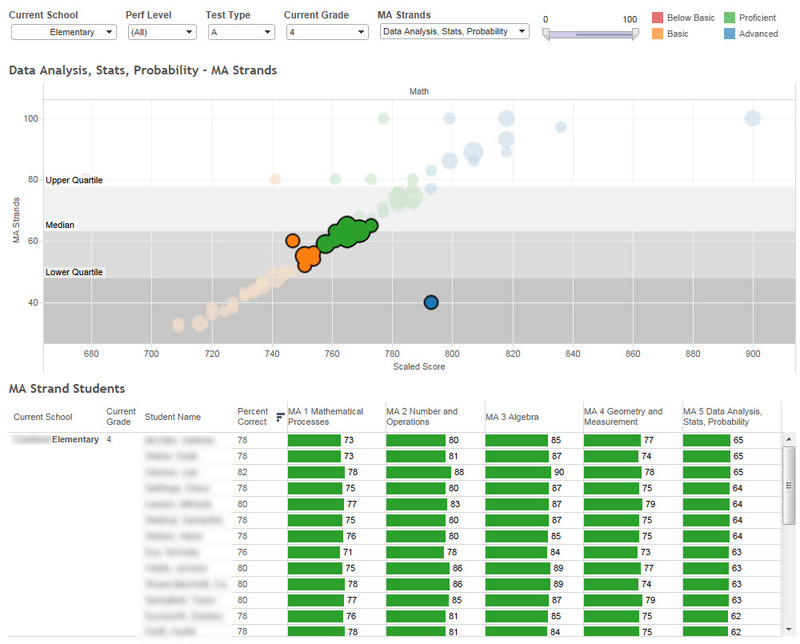 The selection triggers the dashboard to show the results of May by grade level. Clicking on a grade level would trigger the dashboard to reveal the student names and attendance information for the selection. Access to historical attendance is a click away when analyzing current attendance data for any student. 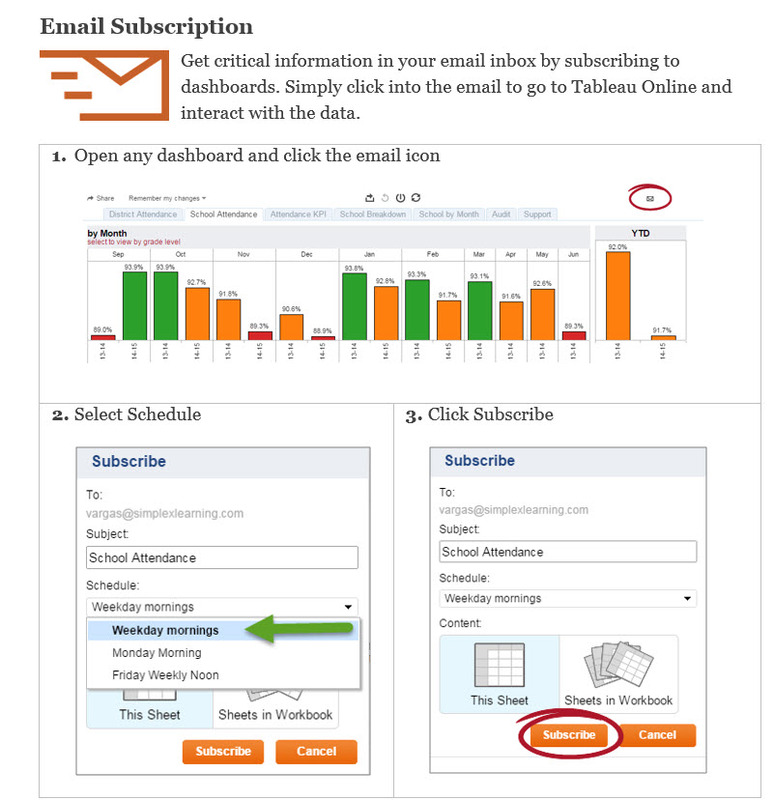 Step one reviews current attendance for any point in time within the current school year. With a click, step 2 is executed and historical attendance records are displayed. Monitor student cohorts using the SIS in your district. Review cohort trends in assessment, attendance, behavior, grades, and adapt support strategies throughout the year. The analysis of student growth is vital to the continuous improvement process in a school system. Use your existing formative assessment system to create an integrated growth measurement tool. Analyzing student performance data by overall achievement is a practice used by all districts and schools. 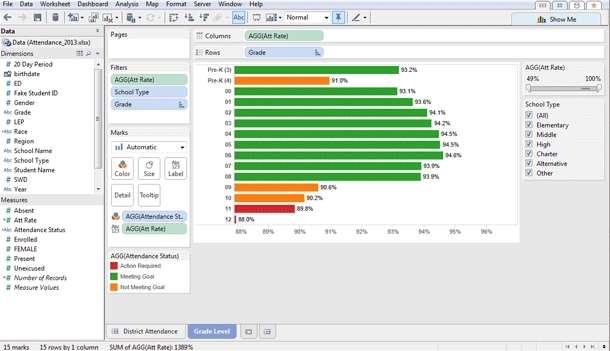 The same data can be analyzed at a deeper level by changing the analysis to strand data. Instead of providing supports for students by overall performance levels, they can be aligned by strand performance. Strand performance analysis allow schools to align supports for the individual needs of students regardless of overall performance levels. An "Advanced" student might benefit from the same support that a "Below Basic" student receives if they both perform in a similar way on an individual strand (i.e. data analysis and probability). Alternatively, a student at the "Below Basic" level might not need all of the supports for a subject if their strand performance in one area is strong as suggested by strand data (the time can be used more efficiently). Management of testing events is vital to the fidelity of any implementation in a school district. Increase testing rates by monitoring assessment events across a district, school, subject, or grade level. Over the years we have developed hundreds of assessment dashboards. New dashboard designs are often the result of a new need in a district with a new testing system. What was important to monitor one year might change in a subsequent year based on changing enrollments, district initiatives, and student performance. 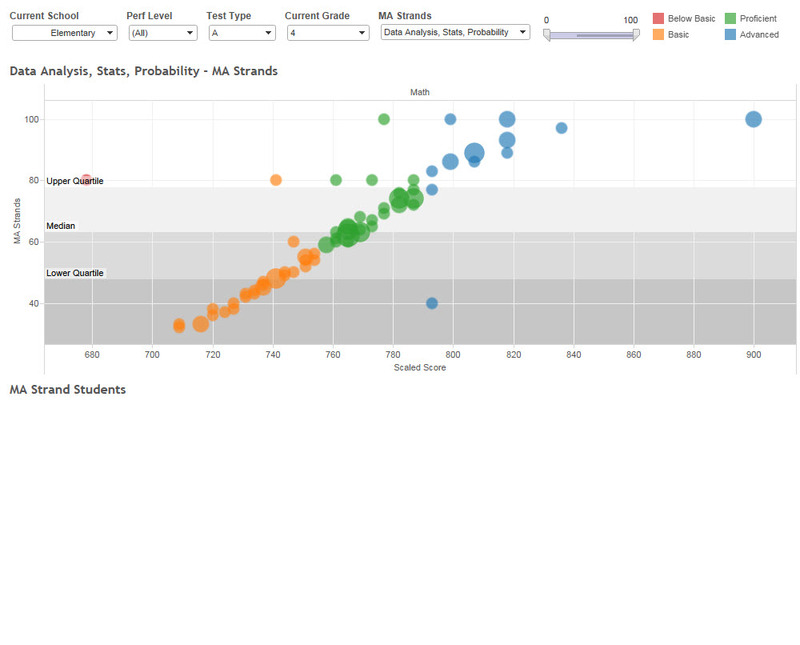 We explore new ways to connect and visualize student data on behalf of our clients. We gladly accept new development challenges to meet client requests that can benefit a district or school. If we don't have a specific assessment dashboard for your requirement, give us an opportunity to develop it for you. Keep a running tab on the total number of behavior incidents in your district or school. Recognizing the peaks and valleys in student behavior assist administrators to identify positive and negative trends and adjust strategies as necessary. Each school has a unique culture. The tools to monitor student behavior should reflect those differences. Generating a top N infraction list by school or district can be automated for all administrative teams with data that updates each day. Corrective actions and behavior supports for students should be informed by historical data. In theory this is a no-brainer, but in the field it is different, connecting to a rich historical view of a student is not easy for any SIS. Our system connects to historical data with one click. Access to historical behavior data is pivotal to creating strategies for a behavior improvement program for students. The measurement of student performance should not be limited to formative and summative assessment. The analysis of student grades captured by your SIS reveals performance patterns in the classroom. Every school and district is required to capture and archive student grade data. The use of such data on a frequent basis can help administrators intervene when necessary. We design student grade dashboards that allow for the identification of courses where a high percentage of students are failing. With simple controls, similar to what are used when purchasing an airline ticket online, a practitioner can pinpoint struggling courses in a school or district. Finding these courses early is key to providing supports to students or teachers. Auditing student grades using this method is like "Finding a needle in a haystack" because grading distribution data are most often presented in aggregate format with no access to the underlying student data and no ability to analyze trends across students or courses. We provide all of the tools necessary in our student grades dashboards to improve how these data are used in K12 education. Students that struggle in a course might not be alone. Our dashboards are designed to highlight the performance of cohorts in one course compared to all courses taken. Don't be surprised to find courses where 70% of the students are failing while performing well in all other courses. Not only can you find them in our system, you can locate issues early and in time to adjust strategies for the remaining year. The federal government requires districts to archive student grades in the SIS. Often times this data is not readily available to school leaders in a format that can be easily analyzed. We work to extract all historical grades, as far back as your system allows. In many cases, we have successfully extracted 9 years of student grade data. Why would a district want 9 years of student grade data? Historical grades are integrated into a student's profile. When analyzing grades for a current term and viewing a student's record, all historical data becomes available with one additional click. This allows a practitioner to review the life of a student's grade performance over multiple years of instruction. A student that struggles in Algebra I might have struggled in math since grade 6. Without a comprehensive dashboard system one cannot begin to review these types of data. Every piece of data in a school district can be connected to geolocation data and analyzed in an interactive map dashboard. Students, certified employees, non-certified employees, bus routes, school locations, district assets and other data can be visualized in real-time on a map. Our system converts your physical addresses into geolocation coordinates automatically each night. When addresses change in your system, and they will change often, new geo coordinates are generated and reflected in your dashboards the very next day. Extract teacher observation data from your platform and keep track of events as they occur. No longer do you have to worry about compliance issues, late follow-ups, or missing observations. We design observation dashboards that are actionable and built with your system's unique requirements in mind. We connect to your teacher observation platform and build an array of dashboards available to district and school leaders. Call or schedule a meeting with us to discuss your observation requirements. Never lose another observation event due to lost information or limited reporting. Our dashboards can be scheduled to email daily so you never miss an early warning sign. Pinpoint and report erroneous data in the observation system to contribute to a continuous data cleanup effort. We integrate with any system that produces data. Contact us to discuss your district's data dashboard needs.